Perhaps one of the surprising things about the independent restaurant and cafe scene in London is its sense of community. You only have join in the conversation on Twitter to see the messages of encouragement when chefs leave a restaurant employment to start up on their own, or when new branches of well respected outfits open. Why should there be this generosity towards rivals? Recessions have a habit of engendering communal spirits, and this has been precisely the case over the last couple of years in Mentmore Terrace, by London Fields. 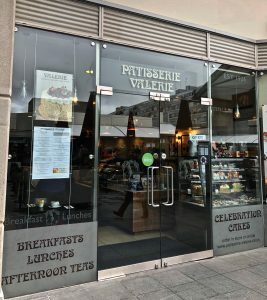 Lisa Stockton and Ellie Pennington originally set up the Happy Kitchen Bakery in premises in the Terrace shared with the E5 Bakehouse and Mini Magoo. 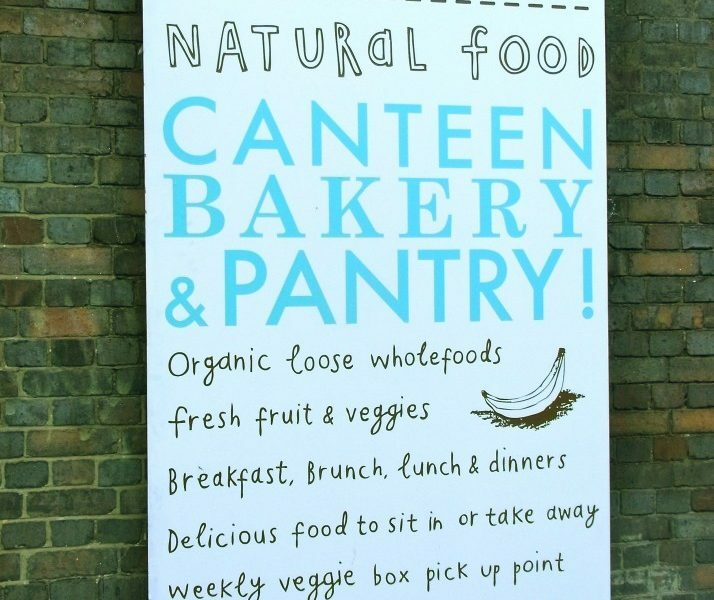 All three organic businesses are now flourishing independently: Mini Magoo organic cereals sell well in Planet Organic, from their stall in Borough Market and are distributed in France; E5 Bakehouse, written about previously, has deliberately no expansion (or distribution) plans. The Happy Kitchen Canteen opened this year a couple of doors down in the Terrace from E5 Bakehouse, and definitely does have aspirations for expansion; it will be interesting to watch their progress. Their concept is multi-faceted, but the common theme is organic, plant based, gluten-and-sugar free. And being rooted in the community, for the well being for all. If this sounds a bit saintly, it’s not the impression you get when you visit. The interior is light and homely, but with fun graphics everywhere drawn by the bubbly brand creative designer Rachel Gale, who also manages the canteen most of the week. There is an impression that this is an embryo brand in the making, along the lines of Ella’s Kitchen in the baby food world. Having a venue where people can visit and experience the ethos is a good way to build it. Healthy home cooking is what is being promoted here and there are also special pop up dinner events to further spread the word. Considerable attention to detail is paid to every step of the supplier selection and production process, right down to the reverse osmosis process for purifying the tap water for the tables and washing the vegetables. The coffee comes from St Ali coffee roasters in London, and the organic milk for the coffee from Northiam Dairy in Rye, Kent. The canteen is open for breakfast and then throughout the day serving soups, casseroles, salads and lots of cakes, brownies and muffins. So a good place for families with children. On my way out last Sunday though, I spotted a very grown-up delicious-looking buckwheat pancake topped with smashed avocado, grilled and sun-dried tomatoes, spinach and paprika yoghourt. The ambition of many small producers is to feature in a small way in a supermarket, and even if many protest that they only want to be sold in independent food outlets, it is hard to resist not being excited by a visit from a Waitrose buyer. Cakes are what Happy Kitchen are currently selling wholesale, particularly the chocolate brownies which are finding retailers nationwide. Watch out for the Christmas special amaretto-soaked sultana brownie. But this outfit is ambitious and I have no doubt that the range of products are set to increase. Their admirable strapline is: “building community through food” but I suspect the interpretation of this is more than local, and they are going the right way about it.